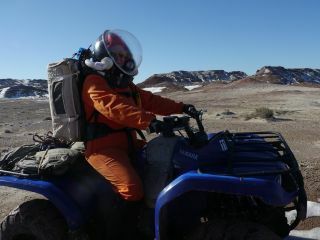 Crew 133 commander Paula Crock riding an all-terrain vehicle near Utah's Mars Desert Research Station, Jan. 15, 2014. Editor's Note: In the Utah desert, scientists are attempting to recreate what a real-life mission to Mars might be like, and SPACE.com contributor Elizabeth Howell is along for the ride. Here's her latest dispatch. HANKSVILLE, Utah — As I revved the all-terrain vehicle up the steep hill, I could feel gravity and mud pushing me back from the crest. I leaned forward in my spacesuit and with my right thumb, pressed hard on the throttle. The vehicle shuddered, hopped, and at last reached the top. Now to make sure Crew 133's commander made it. After rolling forward a few feet, I checked a small mirror on my left arm to watch Paula Crock's progress behind me. She had somewhat more trouble, but managed to get up the hill by maneuvering the vehicle left and right during the ascent. For me, a Canadian used to slippery roads, the muddy terrain reminded me of driving on roads slick with freezing rain in Ottawa. The big difference, however, is if something broke or someone fell, we'd be a long way from help. One of Crock's research projects here is to map out "dead zones" or areas of non-existent radio communication around the main MDRS habitat. Our radios are too weak to communicate across long distances, so knowing where these dead zones begin would be a great asset to safety. The isolated road that journalist Elizabeth Howell followed near Utah's Mars Desert Research Station had steep slopes and icy and muddy pathways. Once we drop out of radio comms, it's up to each other to make sure other crewmates are all right. I checked my mirror at least once a minute to make sure Crock was right behind me. When we hopped off the ATVs at the Hanksville-Burpee Dinosaur Quarry, we kept each other in sight. That came in handy when I got temporarily stranded on a hill. I misjudged a slope and found myself lying on a bed of pebbles, unsure of how to get up or down safely. Since my present position was stable, all I had to do was call over Crock (an experienced hiker) and discuss what to do next. A few minutes later, I scrambled up the hill on my own feet to stand next to her, and to head back to the vehicles. Past crews have flipped ATVs accidently before, which is easy to do because the vehicles we have are only two-wheel drive. Ice, mud and severe uneven roads compound the driving situation. During our initial safety briefing, we were advised to drive the vehicles no faster than a walking pace. That was plenty on this terrain. With mud and water mixing on the drive back, I slowed driving to a crawl and kept steering to a minimum. The exception to my self-imposed rule was when I spotted a crack in the road that was big enough to trap a wheel. Best to take the long way around, I reminded myself. Hills could also be treacherous on the way down. Every time I reached a crest, I'd slow slightly and scan the area below. If the slope was steep enough, I'd ease off the gas and let gravity do its job in pulling me down. It felt like soaring, but rather than focusing on the sensation, I kept my gaze focused on the road ahead.